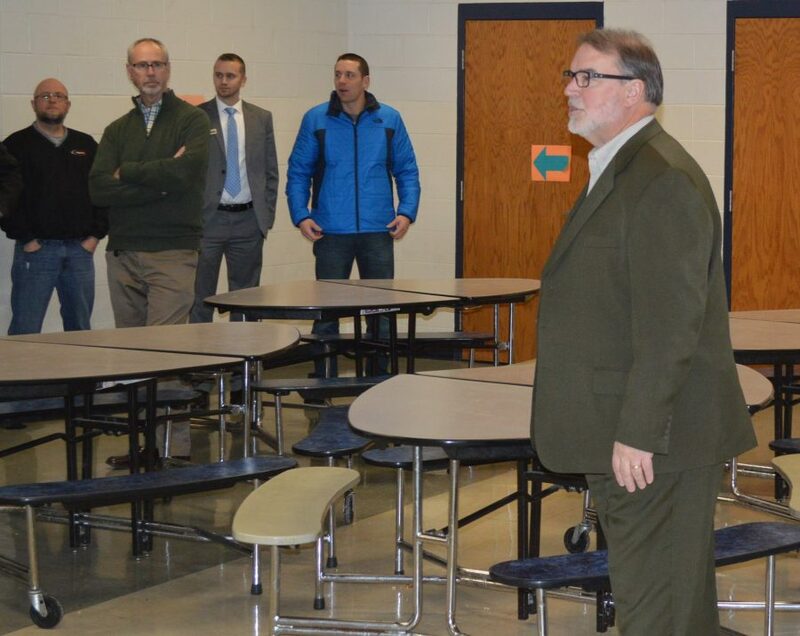 Dr. Tom Edington, far right, superintendent of the Wawasee Community School Corporation, talks about some of the details of the cafeteria during a tour of the current Syracuse Elementary School. On the left are Rob Fisher (Wawasee school board), Rob Staley (executive director and CEO of The Crossing), James Flecker (director of personnel and legal services for WCSC) and Tyler McLead (Syracuse Parks Department program director). In the meantime, the Wawasee Community School Corporation is considering various options for what they will do with the building in the future. Monday evening, Jan. 30, at the current Syracuse Elementary a meeting was held for the purpose of answering questions about the building and several community organizations and government entities were in attendance. Dr. Tom Edington, WCSC superintendent, said the building is still in pretty good shape overall but some work is needed and it was decided instead to build a new school on a different site. “We didn’t want to buy houses and then have to demolish them and ruin a nice neighborhood,” he said. He noted the building is about 86,000 square feet, part of the roof is still under warranty and the boiler room equipment is relatively new. There is some asbestos in floor tiles in a few places but it is sealed and new tile can be placed over it. The bleachers in the gym are in good shape, but not up to current code because they are not handicap accessible. The restrooms are also not handicap accessible. “It’s still a very useful building,” Edington said. After a tour of several classrooms and other rooms, including the cafeteria and gym, a meeting was held and several questions were answered. Among those represented were the town of Syracuse, Rock Solid, Syracuse Parks Department, Syracuse Food Pantry, Syracuse-Wawasee Chamber of Commerce, Wawasee Kiwanis Club, Syracuse Town Council, The Crossing and others. Another question asked was if any analysis has been done on using the space for an early childhood development center because there is a local need for it. Edington said no study has been done and noted Kosciusko County did try to get into a funding stream for early childhood development but was not successful. Pastor Mark Eastway, representing Rock Solid, asked about the average size of rooms in the building. Edington said it would depend on the room. He noted for a three-month period an average monthly electric bill for the building was $7,448.95, gas $1,785.58 and the monthly maintenance is about $10,000. In response to a question about whether a sprinkler system is in place, Edington said there is no system due to the age of the building “but there are several exits out of the building.” The building was originally built as a high school in the 1920s, then added on to in 1954 and that portion of the building is mostly used now. Edington did not rule out the possibility the school corporation will continue to use the building. “We are looking and thinking just like you are,” he said.